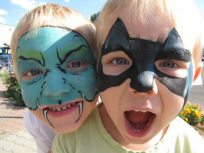 Fun, friendly, and professional face painting with affordable rates! I can be reached at 509-899-9509 or email at kochenter@gmail.com to reserve. I love to paint! Age range: 1-100!